Yesterday Microchip, makers of the PIC line of microcontrollers, announced they were buying Atmel, for a cool $3.56 Billion. This isn’t entirely surprising considering the ongoing consolidation in the industry, It was only last year that Dialog attempted to purchase Atmel, and before that ON Semiconductor and Microchip. In December of 2015 NXP and Freescale (formerly Motorola Semiconductors) merged, creating one of the largest microelectronics companies. These mergers do create an interesting result, product mixes that were formerly competitors, end up being marketed side by side. 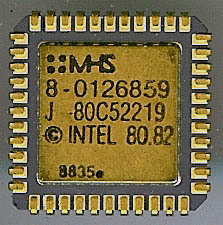 In the case of NXP and Freescale, NXP marketed many MCS-51 microcontrollers in their 8/16-bit lines, while Freescale of course sold many versions of MC6800 based MCU’s. These two rivalries have existed since the early 1980’s and likely will continue. Perhaps the biggest rivalry in MCU though is between Atmel and Microchip. Today the PIC line continues to be popular, with devices for the low end, such as the PIC10/12 all the way to the MIPS based PIC24 on the upper end. 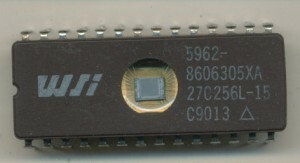 Atmel continues to make 8051 MCUs, but also makes the 8 and 32-bit AVR line, perhaps best known today for its use in Arduino boards. They also make MCU’s based on the ARM core, a competitor to MIPS, and Atmel’s own AVR32. Likely to the consternation to many fans of either company, this merger does make sense, more so than ON or Dialog buying Atmel. While Microchip and Atmel both compete in the same markets, they do so with different architectures. Product lines are unlikely to change, and overhead saving should free up $$ both for stockholders (yawn) and engineering teams alike. No word has been giving yet on wether Microchip intends to keep the Atmel branding, but perhaps they should, as an AVR MCU with a Microchip logo on it may just prove to be too much for some. In the 1970’s second sources were quite important in the processor industry. They provided a stable supply of a designed in part if the primary manufacturer (which often only had a fab or 2) had problems. They also could widen the market for the processor. Many of these agreements were kept active for decades after, resulting in some interesting results. Motorola licensed many of their design to SGS, which later merged with Thomson to become STMicroelectronics. though the Thomson name was still used. Thomson license built most of Motorola’s product line, as well as many high reliability versions. In 1999 Atmel bought Thomson-CSF Semiconductors, and continued to make Motorola products (in their Grenoble France fab), which now included Motorola’s PowerPC line as well as the 68k line of processors. This portion of Atmel was sold to e2v (in England) in 2006, which continued to produce the Motorola (now spun off as Freescale) PowerPC line, now branded as e2V. The packaging used by e2v (and previously Atmel) is the same as that used by Motorola/Freescale. 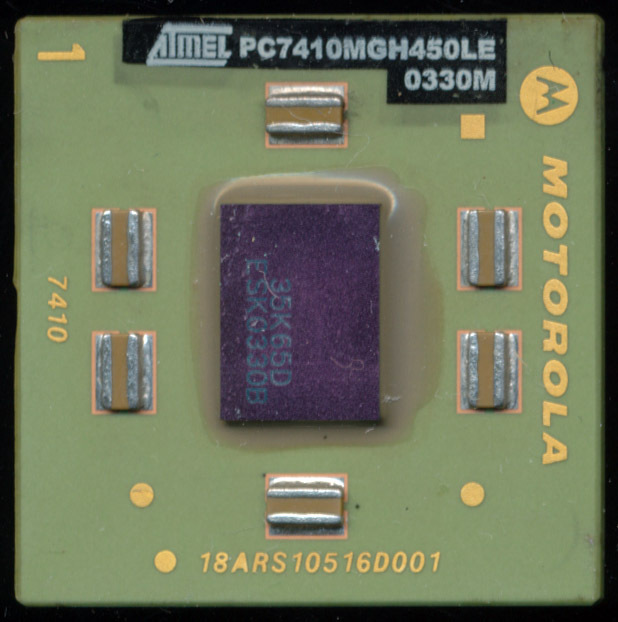 The packages were custom made for Motorola/Freescale by Kyocera (and others) and so often chips with both Atmel/Motorola and e2v/Freescale markings can be found. It is this packaging that is of interest, as it shows an interesting aspect of processor design. Unusual double marked Intel HC2708. Intel used ‘H’ for a brief time to denote a windowed DIP package. UV-EPROMs are a technology made obsolete in an incredibly short period of time by widely available, and more flexible, Flash and EEPROM technology. Processors evolved, DRAM and SRAM evolved, EPROMs simple ceased to exist. There were attempts to make them faster, lower-power, or in more convenient packages, but at the end of the day (or the end of the 90’s) shining a UV light into a small round window to erase them simply became a sign of an era long passed. That window, however, also allows for the beauty and in some cases massiveness, of their silicon dies to be seen by all, something today’s black plastic flash simply cannot do. 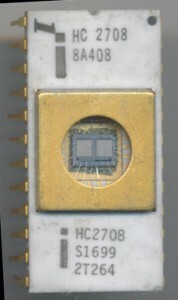 AMI made many custom chips for clients, as well as second sourced various designs. 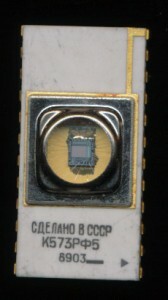 This is a S5204A, a copy of the National Semiconductor MM5204. Made in 1976 it stored 4kbits and had a ‘fast’ access time of only 750ns. It could be fully programmed in ‘less then a minute’ and took ‘only’ 10 minutes to erase all 4096 bits. Power draw was 750mW max, about the same as a 800MHz Intel Atom processor. 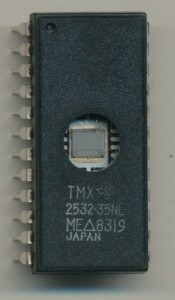 The Atmel AT27C256R-55LC was a CMOS 55ns 256kbit EPROM in a surface mount package. Made in late 1996 it was the beginning of the end for EPROMs. Intel used some unusual packages for a few of their EPROMs. This package was more commonly used on things like C8751s. Here it is a C27C202-70V05 Engineering Sample. This is a 2Mbit EPROM. No EPROM collection is complete without at least a few examples of Soviet EPROMs. If anything for their amazing packages. Here a Soviet of unknown plant K573RF5 made in 1989. This is a clone of the Intel 2716. The Soviet bloc mastered making EPROMs with plastic packages, but this never caught on in the western market. I have never seen a production EPROM in a plastic package out side of East German/USSR. However I did acquire a plastic TI TMX2532-35NL. TMX denotes it as a prototype. The military and industrial markets continued to use EPROMs far longer then the commercial/consumer markets. Cost being less of a concern then reliability. EPROM’s had a proven track record and thus were used until Flash had proven itself. 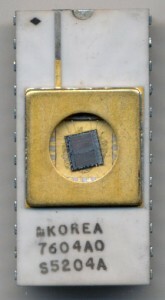 This is a Waferscale Integration (WSi) 27C256L-15 mil spec EPROM. Today Atmel purchased MHS Electronics, a French company. Why is this interesting? Because this is not the first time Atmel has bought MHS, in one form or another. Atmel, Matra, MHS, and Temic’s histories are rather intertwined, with mergers, acquisitions and name changes occurring frequently over the last 25 years. 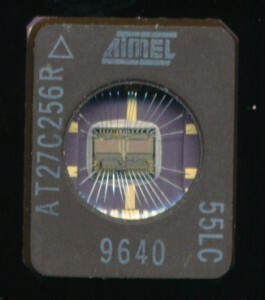 Atmel was founded in 1984 by George Perlegos, a former Intel employee, as a fab-less semiconductor company. Originally Atmel designed EPROM’s and PLDs. They were manufactured by Sanyo, which had an Intel license. Intel, however, sued Atmel (along with Hyundai, iCT, AAS, Cypress, and Pacesetter Electronics) over EPROM patents in 1987. The courts sided with Intel which severely hampered Atmel’s ability to make EPROM’s. Their focus then switched to non-volatile memories, such as Flash for which they have become very well known and continue to make. In 1989 they bought their own fab (from Honeywell) in Colorado Springs, CO and in 1993 released an 8051 (Intel licensed) with integrated Flash memory. This catapulted Atmel into the microcontroller market that is today one of their core businesses. In 1994 Atmel Purchased SEEQ, an EPROM and EEPROM company that Perlegos helped start in 1981. In 1995 Atmel opened a fab in Rousset, France, thus beginning the French connection. Matra Harris Semiconductors SA (MHS) was created in 1979 as a joint venture between Matra, the French high technology group, and Harris Semiconductor, an American semiconductor manufacturer. In 1989, Harris withdrew from the partnership, and the name was changed to Matra MHS SA. Two years later, AEG (The electronics division of Daimler-Benz) purchased 50% of Matra and merged the unit with its TEMIC Semiconductor subsidiary. In 1998, AEG purchased the remaining shares of the company and the name was changed again, to MHS SA. The result of all of this was Atmel now owned Temic, MHS, 2 fabs in France, one in Germany, their original fab in Colorado as well as a fab in England, and one in Texas. Atmel needed to consolidate their fabs so in 2005 they sold the MHS fab in Nantes France to Xbybus, a French company. Xbybus ran the Nantes fab as MHS Electronics. 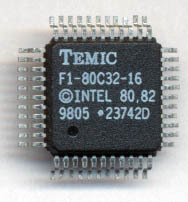 In 2008 Atmel sold their fab in Germany (the former TEMIC fab) to Tejas semiconductor. This left Atmel with one fab in Colorado, and one in Rousset, France. Labor issues at the French fab in regards to Atmel’s need to reduce production led to indefinite strikes at this fab, hampering Atmel’s work to sell it. Finally in 2010 Atmel received approval from the French gov’t to sell the fab to LFoundry, a French company. This marked the end of Atmel’s fab presence in France…..
Today, Atmel has bought MHS Electronics, and their fab in Nantes, France, a fab they owned from 1998-2005. MHS had been having financial troubles since 2008. An interesting end to a series of event that began over 30 years ago. I suspect though that we have not yet heard the last of MHS, or perhaps TEMIC. Most mobile electronics runs on around 3V. For example your cell phone typically used a 3.7V Li Ion battery. For some applications this much battery is not wanted, or feasible. A single AA battery produces 1.2-1.5Volts, but as it is used this voltage will drop. Atmel has just released a new line of their Tiny AVR (RISC microcontrollers that can run at voltages down to 0.7V. Internally they are a 3V design, but they include a boost converter that can boost voltages from 0.7V to 1.8V to the 3V needed by the core, as well as the 4k of flash and 64bytes of on-board EEPROM. All of this, in a 20 pin package running at up to 8MHz and costing a mere $1. This is why there is a microcontroller in almost every piece of electronics.